October 23, 2006 | Gut shot, ante, big and small blinds, kicker, all-in. Haven't heard these terms before? Welcome to the world of Texas Hold 'Em poker. In the last three years, poker has became increasingly more popular than in the past. One of the biggest reasons is because of the World Series of Poker (WSOP) tournament that was held back in 2003. The normal entry fee in this tournament is $10,000. Online poker sites, such as Pokerstars offered a free entry spot if you won their online tournament. An accountant, Chris Moneymaker, 27, got the free entry and went on to win the highest award given in poker, the WSOP bracelet, and $2.5 million. After this tournament, every online poker player thought they could compete with the professional poker player. This notion still stands today. The media coverage of such events has also popularized poker into mainstream culture. ESPN, the biggest sport station in the country, regularly shows such events. Showing poker on TV has changed with the "pocket cam." This gives the audience at home the opportunity to see what every person at the table has in their hand. It also gives odds as to how strong or weak that hand is. "Watching the tournaments on TV always gets me excited to play with my friends," said Mike Goodman, a senior majoring in engineering. Along with TV, even the big screen took notice of the popularity of poker when they came out with the movie "Rounders" starring Matt Damon. The movie is about two young men who pay their debt off by playing underground poker. This movie has influenced a lot of young people into believing they can also live the same life that the main character does. The popularity is not only with males. According to the Boston Globe, in 2005, more than 600 females entered the ladies Texas Hold 'Em tournament, almost three times the number from 2004. "There's no disadvantage to being a girl when you are playing with guys," said Courtney Tye, a junior majoring in math education, "and it's a lot more satisfying when you beat them." 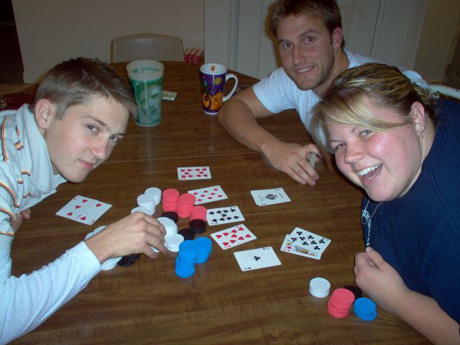 Hold 'Em has become popular because anybody can do it. It doesn't require any physical capabilities besides looking at two cards and placing betting chips on a table. Being a professional isn't anything except a label. As Chris Moneymaker proved, an amateur can win playing with professionals. It's also very easy to learn. Much easier than chess. Like chess though, it's a different game each hand. You'll never get the same reaction on any given hand. "Besides the competition, I like being with friends and people that make me laugh and smile," Jared Stewart, a freshman, said. This is another big reason why poker is gaining popularity. It promotes competition, brings friends, and sometimes enemies, together in the same room. Playing with people that enjoy the game will always bring good memories, even if you don't end up taking home the bracelet.